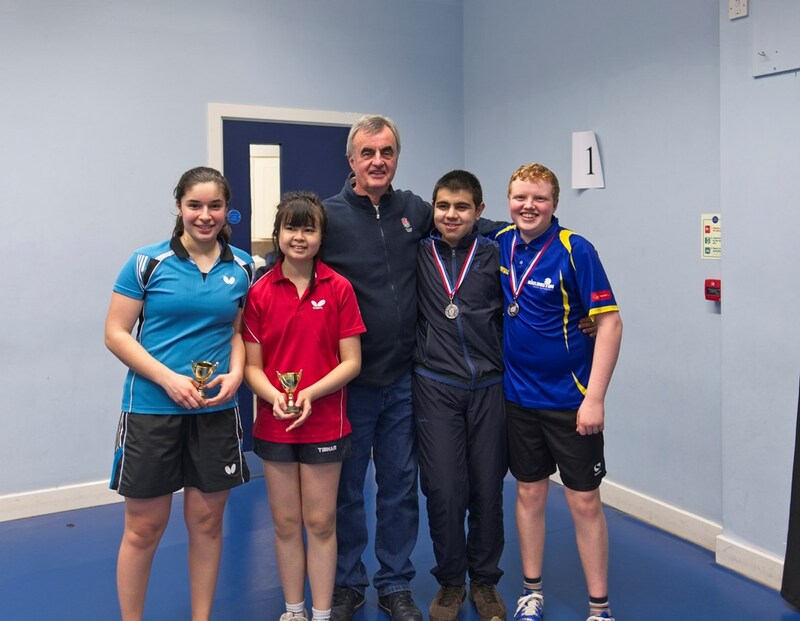 Vicky Coll, in her last year as a junior, carried all (or almost all) before her in the annual City Junior Championships, held at Kidlington Forum on Sunday, 24th February. 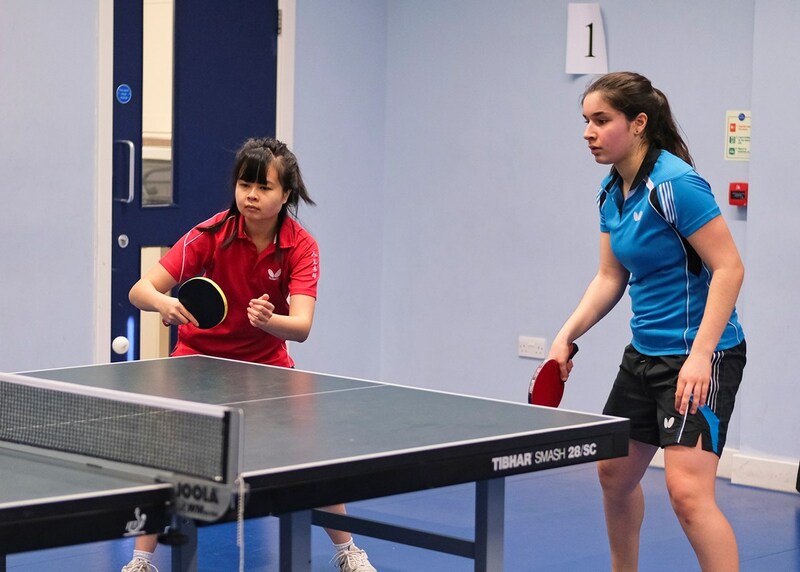 Most remarkably she teamed up with 14 year-old Pelin Karabulut to win the Open Doubles, defeating Kiarash Shaddel & Scott Campbell 10, -7, 9, 9 and the Banbury pairing of Toby Dow & Ethan Morgan 4, -8, -5, 8, 12. She also won the mixed doubles, partnering Kiarash, and an exciting girls’ singles final, almost losing in the 4th to Pelin before taking the decider 11-7. Basic lessons for doubles: serve and receive serve using your BH, if it's strong enough. This creates a lot of space for your partner to play the next shot. Here Pelin could turn and threaten to hit a FH. What actually happened throughout the event was that opponents kept serving far too long to Vicky, who hit streams of BH winners! Kiarash and Scott attempting a more advanced form of doubles with players moving in and out. This needs lots of foot speed. Here you'd expect the left-hander, Scott, to have moved and turned more to his right, preparing to move in for a FH. 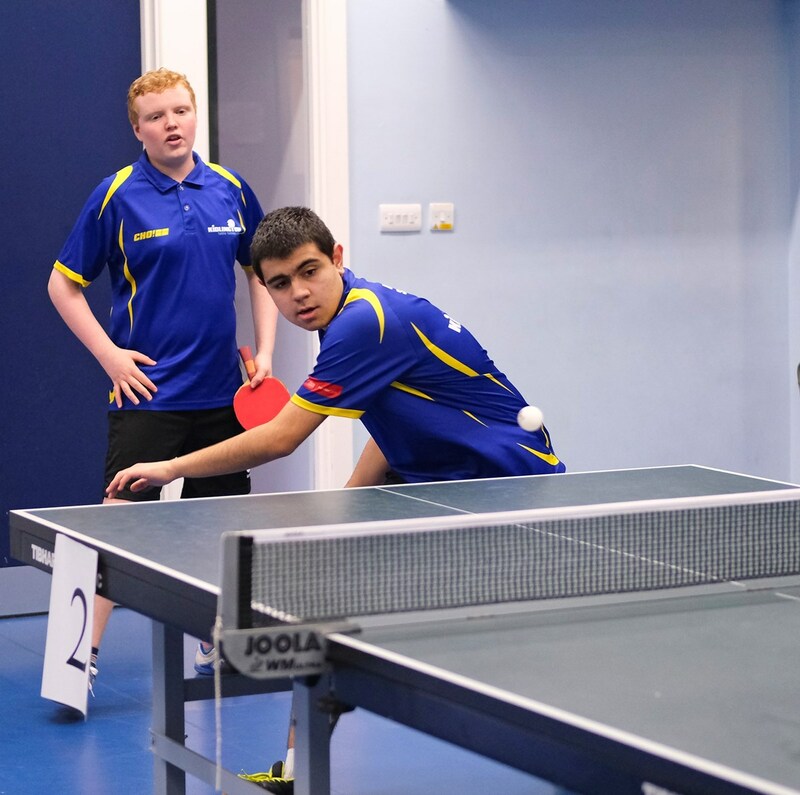 We had 17 players for the Graded Singles, including newcomers Jamie Courtier-Dutton (Faringdon), Daniel Gifford (Didcot), Joplin Herman (Banbury), Rovi Hettiarachchi (Didcot), Harvey Idle (Cowley) and Will Walker (Didcot). 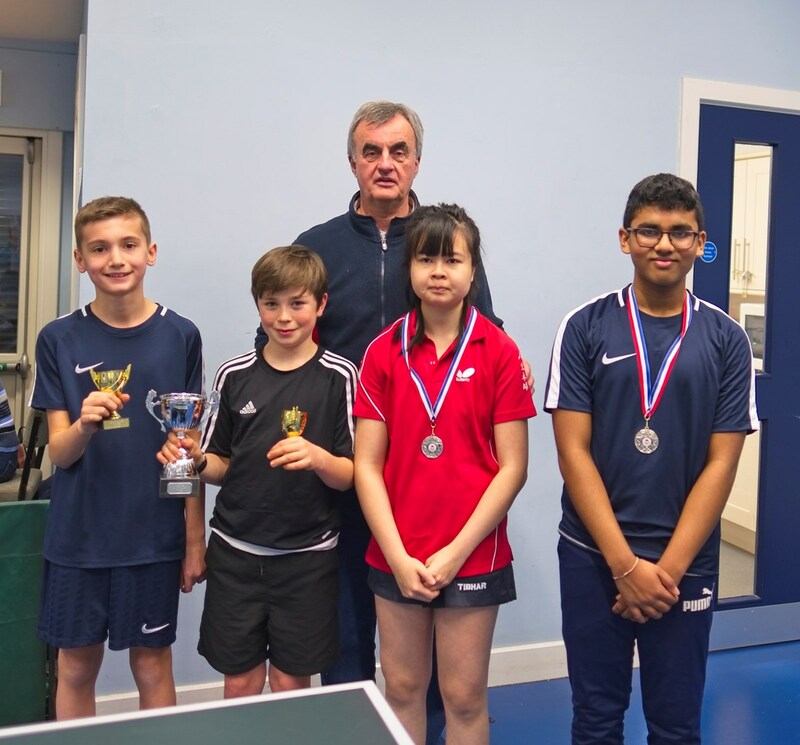 Also competing for the first time from the Kidlington coaching group were Sam Byrne, Sashank Uday, Shreya Uday and Victor Yankov, while the youngest participant, but already into his sixth tournament, was Ethan Zhang (Kidlington). Rovi has 44% in Didcot Div 3, but played well above his station throughout the day, completely defying the efforts of the handicapper. He won his group easily, eliminated top seed Joseph Fisher, scraped home against Ethan Zhang (+4) and demolished the other top seed Hari Selvaraj in the final. Rovi was a revelation, a talented cadet appearing out of the blue! Along the way some other delighted winners were Jamie Courtier-Dutton (11), a very promising player who reached the semi-finals, Sam Byrne, Nicholas Walker and Will Walker (two wins each) and William Berrie (+ 3 v Sashank Uday). Daniel Gifford won the Under 12s, repeating his victory in the Schools’ Under 11 event. Shreya Uday picked up one win in the groups and Joplin Herman got through to the semis, losing to Daniel. The other semi saw nine year old Ethan reaching the final after a fine battle with Jamie. 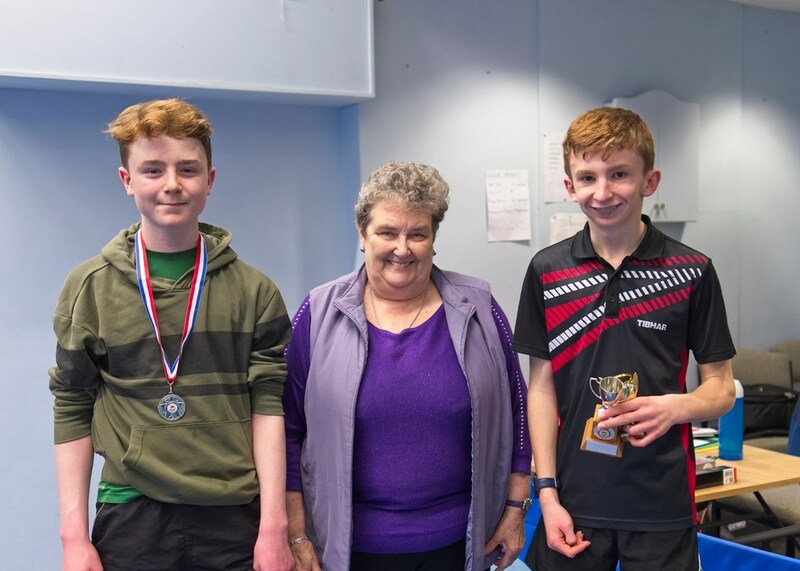 Last year’s double winner, Joseph Fisher, pulled it off again, taking both the Under 14s and the Handicap Doubles (with Sam Byrne). He’s always struck me as a talented player and we are already seeing some of that coming to fruition. In the 14s he won his group ahead of Robert Minell and Sashank Uday. There were surprises in the other group, as Ethan flaked out and Sam Byrne defeated both Nick Walker 7, -10, 6 and Will Walker 7, -6, 8, thus winning the group ahead of Nick. Sam also gave Robert a close match in the semis, but Joseph really sailed through this event, conceding 37 points in 10 games. There were 11 pairs in the Handicap Doubles. Scott Campbell & Victor Yankov had the luck of the draw to reach the semi-finals, where their interest ended, beaten by Joseph Fisher & Sam Byrne (+3), who had eliminated last year’s winners, Robert Minell & William Berrie, in the first round. Vicky Coll & Rovi Hettiarachchi got through round one by the skin of their teeth, beating Harvey Idle & Hari Selvaraj (+4) 7, -9, 10: sudden death! Another well-handicapped round one encounter saw Joplin Herman & Nicholas Walker defeat Sashank and Shreya Uday (+3) 10, -4, 10: that’s two sudden deaths! They were then given +8 to take on Toby Dow & Ethan Morgan, but it wasn’t quite enough: 10, 9. We were beginning to produce accurate handicaps and so it proved in a fascinating final: Joseph & Sam (+5) won the 1st 11-3 and seemed to have it in their pocket, but Vicky & Rovi got on a roll to take the 2nd 11-9 and had knocked off the handicap at 7-7 in the decider, at which point Joseph & Sam raced to victory! These two youngsters (12/13) imposed themselves on this match with their speed and athleticism. In the Under 16s Rovi continued to impress by defeating Pelin Karabulut 8, -8, 4, 8. 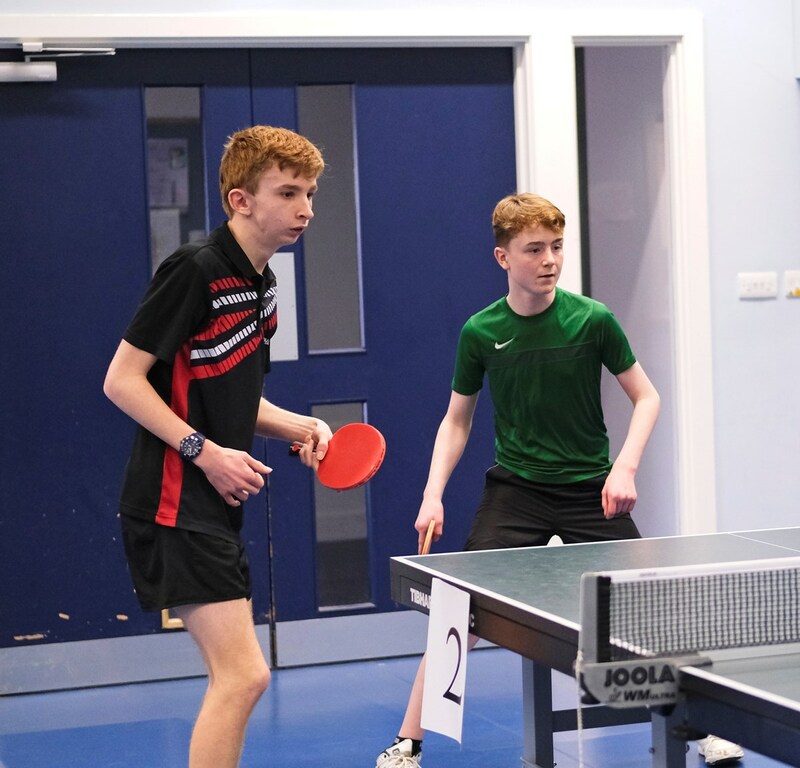 He joined Hari Selvaraj in the semi-finals, but they got little change out of Toby Dow and Ethan Morgan, who proceeded to another of their interminable confrontations in the final, with Toby winning 3-0. They also clashed in the semi-finals of the Under 18s with the same result, Toby having just a bit more zip in his clattering FH hits. Kiarash Shaddel won this event, not without a struggle, being taken to a decider by Ethan in the groups and to a 4th game by Jamie McNeil in the semi-final. However he beat Toby by a clear 3-0 in the final. Special thanks go to Karl Bushell for setting up the arena and supervising throughout the day. As always, Sheila McKechnie did a magnificent job with the trophies. This was a fine, well-disciplined group of young people, easy to look after and with lots of parental support. What used to be reserved just for Oxford League clubs and players has expanded to be virtually a county junior tournament, to the benefit of all concerned, as we are in any case a small county with only three constituent leagues. Oxford had four separate names on the victors’ rostrum, while Didcot and Banbury had two each.